Is it more than you could take? Joshua Ketchmark is an emotional dude. Labeled as a “damn good soundtrack to his life,” Ketchmark’s debut album, List of Regrets, is a lineup of regrettable tunes chronicling heartbreak, watching friends self-destruct, and the like. It’s as heartfelt as can be for a man searching for truth only to be left demoralized by the harsh realities of life – and Ketchmark does a fantastic job of subjecting the listener to that feeling. The album is drenched in lush arrangments and the breathy swoon of a tortured soul. The track “Everything” released in early 2009 and sounds like a throwback to everything you heard in the early 90s, complete with Ketchmark’s guitar licks that offer to do the crying for him. I have a feeling we’ll be hearing more of him in the future. Illinois native Joshua Ketchmark has recently released an impressive debut that happens to be the “soundtrack to his life…it very well could be the soundtrack to yours”. Music is at the heart of Ketchmark’s existence; as an only child, a guitar served as his surrogate sibling. Before long he found himself in Nashville, honing his songwriting chops and picking up more instruments along the way. By incorporating himself into the fabric of musician’s society, he soon found himself working as a guitar tech, providing opportunities to rub elbows with producer extraordinaire Rob Cavallo, Johnny Lang, and Melissa Etheridge. In fact, Etheridge let him use her signature 12-string guitar to record his debut record, which is the first thing you hear in the Byrds-like riff on the excellent “How 2 Let Go”. All Ketchmark’s tunes follow the formula we love: quiet but engaging versus that erupt into a catchy arena-ready chorus. As you would expect from a “soundtrack to life”, Ketchmark touches on familiar themes of romance, but also explores feelings of loss (of his father in “On Your Shoulders”) and finding happiness in the wrong place (the eerie and mysterious “Now”). Overall, the production is great and the vocals are well done (would have enjoyed more pronounced harmonies, though). “List Of Regrets” will satisfy fans of The Calling, Lifehouse, or 2000-era Goo Goo Dolls. What a great way to start off 2010! Ketchmark has delivered a remarkable debut and I look forward to hearing this artist grow into a superstar. 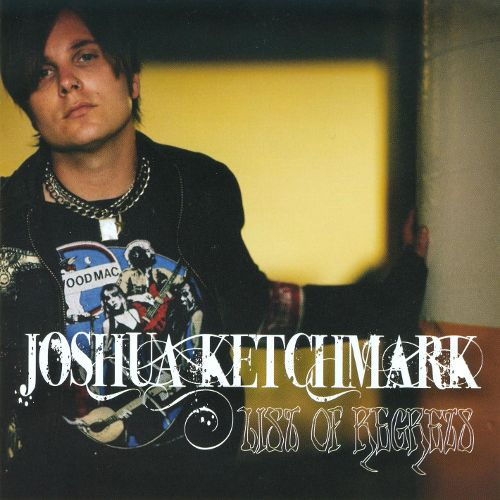 This eleven-track album by Joshua Ketchmark, is a full on, roller-coaster ride through the back pages of downtown potential and West Coast Americana. In other words, List Of Regrets is a high-octane, smorgasbord cross betwixt mid-nineties Matthew Sweet (circa Girlfriend) Ryan Adams (circa 29) and the mighty under-rated Dramarama (circa Hi-Fi Sci-Fi). So, lots to ponder and riddle upon. Gadamer with a guitar (German philosopher, who, by way of Truth and Method, tried to clarify the phenomenon of understanding)? Or, inadvertent sage with a mighty list of pronouncements to make, by way of rock’n’roll? To be sure, when the singer/songwriter moves away from the more obviously clinical rock stuff, the embryonic intensity of drama in such a song as ‘It Doesn’t Mean The Same’ is invariably allowed to breath and shine. A line such as ‘Spanning time between cigarettes and rosaries/And claiming that it’s/The only way,’’ might, in some quarters, be considered as good as it gets. But, because it’s partially and unfortunately smothered with superfluous clutter, it doesn’t quite hit the mark. This is a shame really, because as mentioned at the outset, List Of Regrets has oodles of potential. The sort of which, warrants both recognition and respect.